Posted June 17, 2014 by Eric Graham . We get asked this question a lot, and when we don’t get asked this question we have to ask where are your online reviews? Are gathering reviews for your business a worthwhile investment of time? I say absolutely yes, for a number of reasons. Not the least of which is listening to what your clients are telling you about your business, and how you can use reviews to make your business better. Many times customers leave our business without telling anyone whether they had a good or bad experience using your products or services. It used to be that if you made someone mad at your place of business, they would then vote with their feet and never return without you ever knowing it. These “unknown” people could then be a cancer to your business by telling more people about their experience, making it even more difficult to attract new and quality customers. In today’s world, this cancer can spread even faster if not managed properly. But if you manage reviews properly, not only can get “lost” customers to come back for another try, but you can convert these people to be some of your most ardent fans. But the key here is that you need to be listening and watching for reviews. But what other effects do reviews have on your business? From a local SEO standpoint, reviews can be the difference in placing ahead of a local competitor in SERPs (Search Engine Results Pages), and in smartphone searches. Reviews are what I like to call extra “Authority Points” for Google, Bing, and other search engines. The more reviews you get and better those reviews are, the better your likelihood for elevating your local search engine rankings. 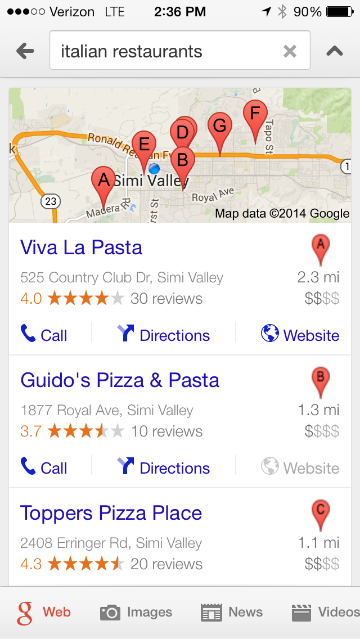 Reason #1: Google Map searches now feature reviews prominently. Reason #2: Ratings and reviews can influence rankings. 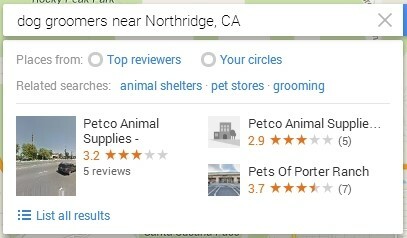 Local Carousel – A study done by Digital Marketing Works (and quoted by Search) found a “very strong correlation” between reviews/ratings and Carousel position. 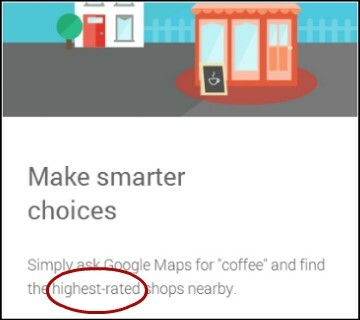 Many other factors contribute to ranking, of course, but it makes sense that Google would show the “best” businesses first to increase user satisfaction. Ask for them. Seems simple enough, but not enough businesses actively ask for customers for an online review of their business. Disclaimer here, never EVER pay someone to review your business. For one you shouldn’t have to, and second it’s unethical and you can be punished for it. Second disclaimer, if your business’ service is bad, don’t ask for reviews. Post Review Sites logo decals near or on the entrance to your business which can remind them to leave a review in these places. Create a handout flyer to encourage reviews. Even include 1-2 actual customer reviews, then leave a reminder that customers can review your business on Google, Facebook, etc. List more than one place. But don’t forget, just as important in getting and attaining reviews, is the ability to reply and respond to both positive and negative reviews. In both cases, thank people for taking the time to leave a review. For a negative review, respond politely, and in some cases be compelled to leave some contact information for an offer to come back and give you another shot. In many cases you can turn a disgruntled client into a lifelong one, simply by getting them to come back for another try. For positive reviews, also thank them and even encourage them to tell their friends about you and your business. Feel free to use a positive review as a content for a webpage, a blog article, or even a social media posting. In conclusion, reviews can be the difference in ranking a place or two higher than a competitor over time if you are diligent about capturing them. But equally as important, if not more so, is taking the time to respond to all of your reviews and reviewers in a timely and respectful manner. This is just another way that you can rise above your competition, but also to build an even more loyal following that will ensure future business for years to come. If you need help managing your reviews, your online reputation, or have any other questions relating to online marketing contact us online or at (303) 703-8000. Great article Eric. I’ve seen first hand how reviews can absolutely ruin a companies reputation simply for lack of responding to them and taking action on trends that appear from them.